Victory Cruise Lines is a small-ship line with sailings on the Great Lakes, Canada and the St. Lawrence River, New England, the Eastern Seaboard and possibly Mexico's Yucatan Peninsula. In 2019, the line was acquired by American Queen Steamboat Company, which operates its two ships, Victory I and Victory II. A third chartered vessel, Ocean Victory, will undergo Alaska sailings in 2021. Second ship from Victory Cruise Lines offers another small ship option for New England, the Saint Lawrence Seaway and Great Lakes cruising. Built in 2001 and refurbished in 2015, Victory I -is a five-deck coastal ship sailing four- to 15-day itineraries on the Saint Lawrence Seaway, the Great Lakes, New England and French Canada. Complimentary features of a Victory Cruise Lines sailing include daily shore excursions, wine and beer at lunch and dinner, afternoon tea, and an included cocktail hour. On its Great Lakes cruises, the line aims to make port excursions special, with full-day tours in Niagara Falls and Mackinac Island. Onboard experiences include special cocktail hour events and themed high teas. In the 2020 season, the shore excursion offerings may change, as American Queen Steamboat Company brings its signature hop on, hop off buses to Victory Cruise Lines. Passengers are generally North American cruisers who are ages 60 and older. 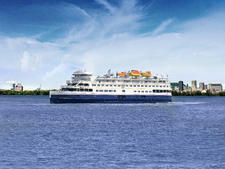 Victory Cruise Lines has two 202-passenger vessels, Victory I and Victory II. Both received a refresh in 2019 when they were bought by American Queen Steamboat Company. The ships have seven cabin categories, ranging from 130 to 325 square feet. All 105 cabins have individual climate control, magnifying mirrors, robes and slippers, flat-screen TVs, safes, telephones and a choice of pillows for queen beds that can be separated into twins. All of the cabins are ocean-view; there are no balcony cabins. Ship amenities include an onboard salon and spa, two dining venues, several lounges, an observation deck and a sun deck. Wi-Fi is complimentary. As part of its acquisition, AQSC will exercise an option to charter Ocean Victory, a new expedition ship for Alaska. The expedition ship will debut in March 2021. The 2019 season will begin in early May for Victory I, which is slated to first sail the St. Lawrence Seaway from Portland, Maine, to Toronto. It then moves to Chicago, where it will begin a season of nine- and 10-night sailings between that city and Toronto. Stops include Mackinac Island, Sault Ste. Marie, Detroit, Cleveland and Niagara Falls. Victory II kicks off its season in mid-May with a cruise from Boston to Montreal. Its regular route will run between Montreal and Detroit, with stops in Quebec City, Toronto, Cleveland and Niagara Falls.